Once you know the basics, additional practice and sparring time will help you consolidate your skills. We hold open fencing sessions Tuesday and Thursday evenings from 7:30 – 10:00 PM. Our competitive fencers can also practice Monday and Wednesday evenings until 9:00 PM. We are open on Fridays from 3:00 – 6:00 PM for lessons (by appointment with the coach). Students taking group classes or camps are welcome to fence during open practice times at no additional charge. 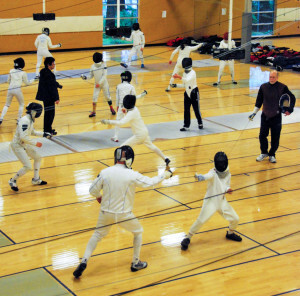 For fencers not enrolled in group classes, the floor fee is $90 per month, or $60 per month for dues-paying members of other Seattle area fencing clubs. For visitors, we offer a drop-in fee of $15 per night. Fencers should use their own electric equipment if they have it. Club electric gear may be rented for open fencing for an additional $35+tax per month.